Morrisons are the first supermarket to trial paper grocery bags at the checkout as the industry aims to drastically reduce plastic waste. Britain’s fourth largest retailer will give shoppers the option of using a large paper carrier bag in eight of its stores this week, after customers at the supermarket revealed reducing plastic was their number one concern. The new US-style grocery bags will cost 20p and have a similar capacity to standard plastic carrier bags. They are 100 per cent PEFC accredited, sourced from forests managed responsibly. As part of the trial, Morrisons will also increase the price of plastic bags from 10 to 15p to help further cut back on plastic use. Andy Atkinson, group customer and marketing director, at Morrisons said: “When we listen to customers they want us to help them reduce the amount of plastic they have in their lives. British retailers are currently battling to overhaul their plastic use following public outcry over significant plastic pollution across the world’s oceans. The UK Plastics Pact, launched last year by Wrap, aims to eliminate single-use packaging, and have 100 per cent of plastic packaging to be reusable, recyclable or compostable by 2025. 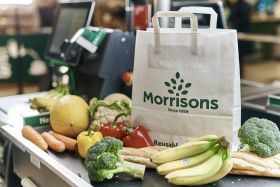 In 2018 Morrisons introduced paper bags for loosed fruit and veg purchases as well as removing plastic sleeves from cucumbers during growing season.